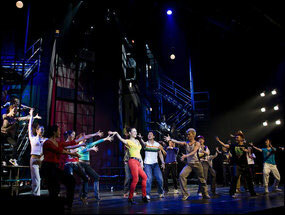 Newsday and various other news outlets are reporting that "Fame", the Broadway musical about high school students aspiring to stardom is being prepped by U.S. producers for a Chinese audience, with a full Chinese cast talking, singing and presumably dreaming in Mandarin. The show had a trial run of 16 performances in December with students from China's Central Academy of Drama, and will now be developed for commercial performances with professional singers reports the Tulsa Times. "Fame" is part of an ambitious plan by Broadway promoters reports the News to expand in China's entertainment market, even as ticket sales at home slump. As the United States struggles with recession, shows like the musical "Gypsy " are closing early. But in China, producers are going ahead with plans for as many as nine Broadway-style shows in 2009 at the same time nearly 13 shutter here on Broadway. The Chinese version of the musical is a sign of the times as Broadway producers abandon the slumping Great White Way in favor of China's potentially huge entertainment market reports the Daily News. Robert Nederlander is a "Fame" producer and had a recent sold out Beijing production of "Aida". The musical 42nd St. was the Nederlander's first foray in bringing Broadway to Asia. Another New York production company, Broadway Asia Entertainment, plans up to five shows, among them "The Sound of Music" and "Annie." It has put on 12 shows in China over the past five years with tours covering up to 20 cities. And Composer/producer Andrew Lloyd Webber announced plans last weekto open his Phantom sequel "Phantom: Love Never Dies" at the end of 2009 with simultaneous openings in New York, London and Shanghai.